One quiet Friday evening of 2006: dark day, gloomy sky, frozen hands, chapped lips and crispy cold hair. Me – feeling chilly, miserable and tired at the end of long day in lab. During my drive in the bus,the images of tomato rasam with steam gushing over my face and peppery chicken curry served with steamy rice kept popping over my head. As I got off the bus, I bundled up the strength and energy to take few steps to the house I lived, meanwhile praying to God that I find the ingredients to cook dinner that day. As I entered the house, B was already there and was chopping onions. I waved a hi and headed to my room to change. I walked back to the kitchen in no time, fresh and re-charged to cook the meal I was craving for. In less than 30 minutes, my curry and rice were ready to be eaten. These were the dishes that would soothe us and alleviate the pains of missing our dear homes and family. When I tasted this curry last weekend, I was transported to those cold winter nights and thoughts about my lovely friends B and V, who are working on their PhD and eating dinners all alone passed by. This dish is for you girls. Hugs! 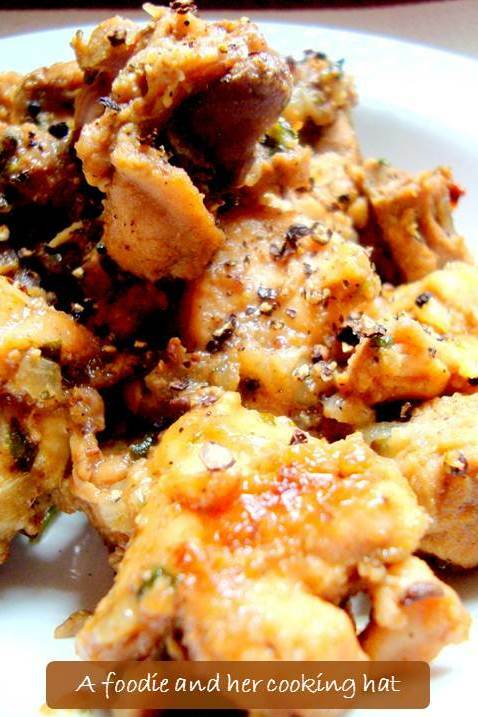 Chicken milagu varuval (pepper chicken) is one the dish which I have made over and over again in my student life. A perfect spicy good dish for the depressing weather in UK. I could call myself an expert at it because I would have cooked it more than hundred times.Cooking proper hearty Indian dishes were only during the weekends and this was yet another special weekend dish. 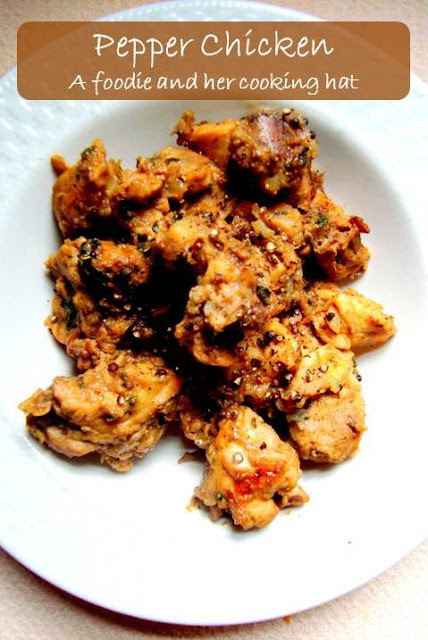 This yummy spicy chicken curry would taste really exotic with yogurt/rasam and rice. Weather in UK is always unpredictable, you can get to see all the season in one day – sunny, windy, rainy and its cold almost throughout the year so your body really craves for spicy dishes and that’s why I cook this quite often. I keep modifying the recipes depending on the ingredients I find in my tiny kitchen shelf. MethodHeat the oil in a kadai and once they are heated up, add the whole masalas and curry leaves. Saute for 60 seconds. Now add the onions and cook till they turn brown. Mix in the ginger-garlic paste and cook for 1-2 minutes. Then add the turmeric powder, chilli powder and coriander powder and cook till the raw smell disappears.Add the chicken pieces and cook till they are browned on all sides. The chicken would cook in its own water. Cook on medium flame for 20-25 minutes. Sprinkle water if it looks too dry for you. Simmer the flame and sprinkle the crushed pepper balls. Mix thoroughly. Cook for further 5 minutes. Serve hot with steaming rice and chilled buttermilk. Slurp,mouthwatering here, just love with rasamrice;. Would like to cook it soon , the same version to the T …please specify exactly how much chopped onion is used here , personally i would like lesser or no onion in this…but i would like to make the exact thing once. I love this dish….this dish has become one of the signature dishes of "Dindugal Thalapakatty" opened in Chennai now. only that they call it "Chicken Idicha milagu Varuval"…. Thanks for dedicating the dish to us hon.. I want those days back!!! !